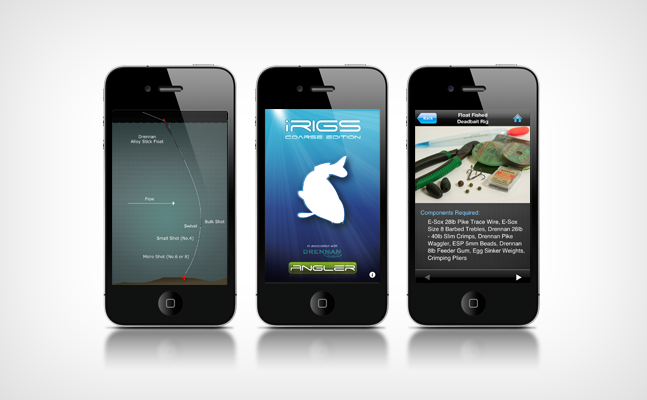 iRigs – Coarse & Carp Fishing rigs by iAngler is the latest edition to the iRigs series. We have teamed up with Drennan International to bring you the very best rigs. Learn to target specific Coarse species including Barbel, Bream, Carp, Catfish, Chub, Crucian Carp, Dace, Eel, Grayling, Perch, Pike, Roach, Rudd, Tench and Zander. iRigs – Coarse & Carp Fishing Rigs brings rig tying to you on your iPhone, whether that be at home, in the office or on the bank. Follow our easy step by step guides and learn how to tie rigs like the professionals. iRigs will help you choose the right rig for every fishing situation and by following our user friendly navigation you can search for that perfect rig via Tactics, Species or Location. Investigate our Tips section to find real edges that will help you land more fish. A selection of some of the finest specimen anglers from across the country have written detailed instructions and photo’s on how they catch those elusive giants. Plus a mystery angler has left a cracking tip. Can you guess who he is? Follow us on Facebook.com/iAngler to find out more. Also included in this app is an illustrated knots guide and with so many different lines available it’s crucial to marry the right knot with the right line. iRigs illustrates how to tie these knots in an easy step by step guide. Learn how to tie The Albright Knot, The Figure of Eight Knot, The Granny Knot, The Grinner Knot, The Half Blood Knot, The Knotless Knot, The Marker/Stop Knot and The Palomar Knot. More content to come in the updates so stay tuned… All this information, for less than a packet of hooks. The app is in the iTunes store now, for only £2.99.